World No. 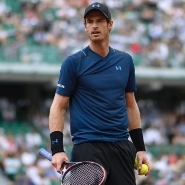 1 Andy Murray advanced to the second round of Roland Garros on Tuesday despite losing a set against Russian Andrey Kuznetsov. The Briton won 6-4, 4-6, 6-2 and 6-0 in a little over two and a half hours. He will play in the second round against Slovakian Martin Klizan. Swiss player Stan Wawrinka, third in the ATP ranking, advanced without problems to the second round of Roland Garros beating Slovakian Jozef Kovalik on Tuesdayin three sets (6-2, 7-6 (8/6) and 6-3). Wawrinka, winner in Paris in 2015, usually has difficult starts in the second Grand Slam of the year, with a defeat in 2014 and five-set wins in 2016, 2012 and 2009. This time he was far superior to a player ranked 152nd in the world. The Swiss will play in the next round against Ukrainian Alexander Dolgopolov. In another first round match Juan Martin Del Potro defeated fellow Argentinian Guido Pella. Five years after his last match at Roland Garros, Del Potro defeated Pella in a duel between Davis Cup heroes. Last year both players helped Argentina win the trophy for the first time in country history. Del Potro won 6-2, 6-1 and 6-4 in one hour and 45 minutes. His next opponent will be Spaniard Nicolas Almagro, who beat Cypriot Marcos Baghdatis 6-7, 6-4, 6-3 and 7-6. Del Potro arrived in Paris with some discomfort in the back that made him question his participation, but did not seem affected by the pain and won against Pella with few problems. Del Potro returned to Paris after a five-year absence due to a history of injuries that interrupted his career repeatedly. He used mainly the power of his right-handed strokes, to defeat Pella, who was helpless against the aggressiveness and skills of his fellow countryman. The main problem for Pella was the amount of unforced errors (31), which Del Potro used to break Pella’s serve repeatedly throughout the match.